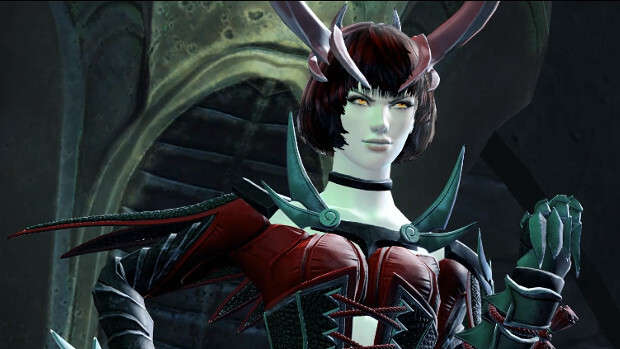 Back in November, ArenaNet dropped the Hall of Chains raid into Guild Wars 2. Now that players have been able to spend some time in the raid — and hopefully nothing will be spoiled for them — raid designer Bryon Miller has published a lengthy post on the Guild Wars 2 blog explaining the process behind creating this kind of content. Primarily, the post focuses on boss design and how to assure players can interact with them in a way that creates a functional and satisfying scenario. It explains things from the top — starting with the table-top planning phase and explains how they brought a well established boss from the original Guild Wars into GW2 without causing any issues with the lore. The post covers some of the early plans — at one point the developers had planned to shackle players to the boss while shuttling some to the edges of the room, but they found this kept some of the players out of the action too much while putting too much pressure on the rest. Once the developers had the plans set, they moved on to implementation, which — as Miller points out — is easier said than done. Sometimes things that work well on paper don’t work well in practice. Still, they managed to get it done, and people have been able to see the results in person for a few weeks now. If you’re one of those people that is really interested in the game development process, you can check out the post in its entirety on the Guild Wars 2 site. Just be aware that if you haven’t already spent some time in the raid, there will be spoilers.